The Oblivia region has tidy beaches, clear seas and lots of sunshine; it's a pleasant place to be whether a human or one of the many free-roaming Pokémon. Things have changed recently, however, with many Pokémon abducted by a villainous gang known as the Pokémon Pinchers (no, really) and it's up to you to put a stop to their activities. 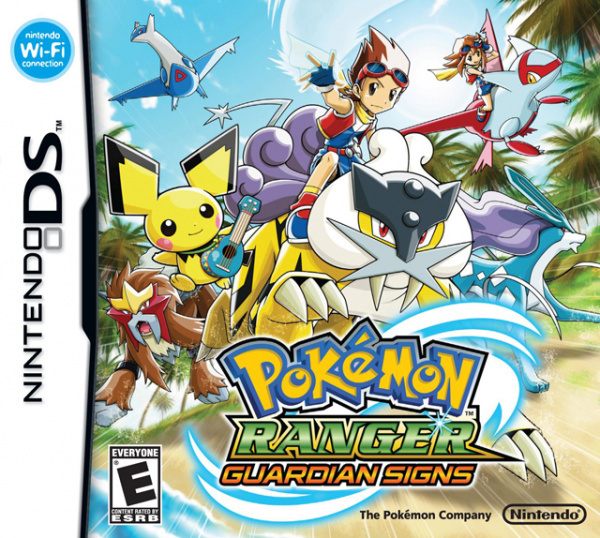 Pokémon Ranger: Guardian Signs is the third game in the Ranger series and whilst it features the circling-capture action of its predecessors, developer Creatures, Inc. did shake things up a little bit in this DS release. 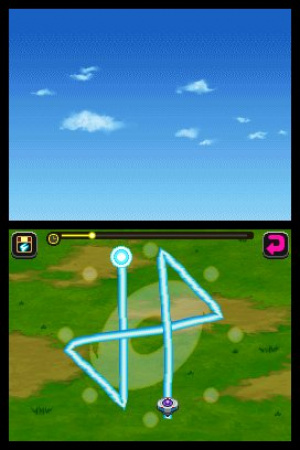 You begin the game as one of two rangers flying high in the sky who come across a couple of Pinchers trying to capture a Pokémon; soon you are using the stylus to fly around the screen dodging attacks. This is followed by an underwater chase section that requires you to hold the GamePad vertically, as you tap to rush forward, avoiding the air bubbles that threaten to slow you down. There are a few sections like this throughout the game which add some variety to the gameplay. As before the control stick/d-pad and buttons are available as an alternative for some actions, but sticking to just the stylus is a smoother experience for walking around, clicking menus and tapping through dialogue. In a change from its predecessors you start Guardian Signs as a fully trained Pokémon Ranger, so there's no lengthy opening as your character learns the ropes. The game still keeps stopping to explain gameplay mechanics to you, but mercifully a lot of this can be skipped. There are 300 Pokémon (made up from the first four generations) in the game which can be enlisted to help on your quest, whether battling or clearing obstacles - and this time around some require the use of multiple field moves. You can easily swap out a creature you think is un-needed only to then have to backtrack when you find that yes, you really did need that third water type. 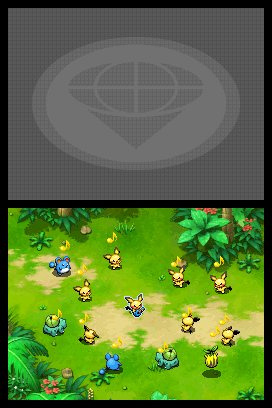 After the second instalment featured a number of options for your Partner Pokémon, it's surprising to come to this game and find you are just given a Pichu. This is a Ukulele-playing Pichu however, and his assist move (playing soothing music) proves to be most helpful during captures. Assist moves from other members of your party are also useful in battle and can actually be used multiple times. Previously a Pokémon would help you out then run off, but in this game they stay with you and (once a meter has recharged) can be used again. A new addition to this game are agitated Pokémon. You can not flee from an agitated creature and when encountered you are required to deplete a red energy meter before a capture can occur. Often for a normal capture just using your Capture Styler will suffice, but assist moves are recommended for the agitated creatures. Ukulele Pichu's tunes are super effective, your frantic stylus circling… not so much. Only using assist moves when absolutely necessary prevents the game being a complete walkover, but in general it doesn't provide much of a challenge outside of trying to get an S rank for the capture of each Pokémon. The strength and abilities of the pocket monsters you encounter steadily increase as you work through the game but your own abilities steadily increase alongside this. You level up as you play and Ranger Points you earn can also be used to upgrade the abilities of your Capture Styler. Consequently when playing through the game the difficulty stays at roughly the same level and it's only during the latter stages you can run into trouble. As before progress through the game is straightforward with you being told exactly where you need to go next, although there are a number of optional short quests you can take on between missions should you see an Oblivia citizen in need of assistance. 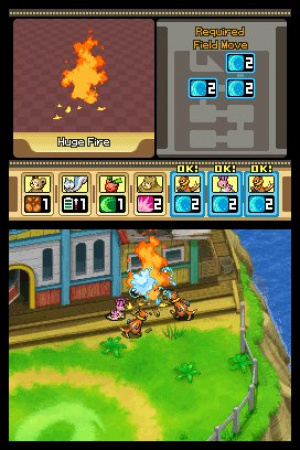 The gameplay mostly involves walking around an area capturing Pokémon, but occasionally there is something else to do such as a puzzle involving reflecting mirrors, swimming underwater or one particularly good sequence where you must climb out of a sinking submarine. The game can provide plenty of entertainment, but it frequently gets dragged down by the story. The characters in this game like to talk a lot and you'll often find sections of the game where you spend most of your time tapping away on the touchscreen to quickly skip through the latest dialogue exchange. It can be particularly frustrating if a long conversation at someone's house ends with you being sent to another village to see someone, who then waffles on at you some more before sending you back where you came from for another lengthy discussion about the latest plot development. Once you've discovered the relevant sign, legendary Pokémon can be summoned and their main use (along with aerial Pokémon) quickly becomes a means of transport as you move back-and-forth between locations. This eShop release comes with the usual Virtual Console benefits such as suspension/restore points, Miiverse integration and screen smoothing. It also comes with the expected omissions and so the downloadable missions are unavailable as is the ability to play some multiplayer (up to four people). The multiplayer missions can still be tackled alone however, becoming available early in the game after a few encounters with Celebi. The multiplayer missions take place in Oblivia's past, providing not just an opportunity to catch some different Pokémon but a change of pace. These temple missions see you racing against a clock trying to capture certain Pokémon before facing a tricky boss encounter. Different partner Pokémon are available and treasure chests can be found providing either an energy bonus or a time extension. A problem with these missions is the fact that they are designed for multiplayer, and you'll soon find that certain areas are off-limits as they require two people to stand on switches to gain access. 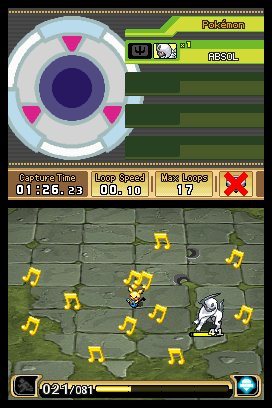 Another issue is that multiplayer allows you and your friends to combine capture lines and perform techniques to ease the capture of Pokémon, but on your own it is a lot trickier as a single Ranger is obviously less powerful. You can level up and increase the abilities of your partner Pokémon, but this requires replaying already cleared missions, turning what should be a fun diversion from the main game into a repetitive slog. As before there's plenty of circle-capture action in Pokémon Ranger: Guardian Signs. The range of different Pokémon keeps things interesting and new additions such as aerial and underwater sections are welcome. The story gets a bit too talkative at times, and whilst there's a variety of things to do there's a disappointing lack of challenge in the main quest. The "multiplayer" missions are challenging but that's mostly as a result of having to tackle them solo. 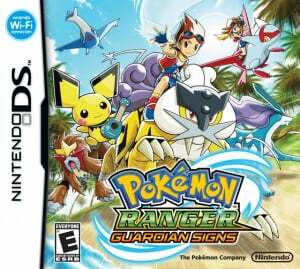 Like the Ranger series in general, there's fun to be had with Guardian Signs but it's not a must-buy Pokétitle. @Miles_Edgeworth And I'm waiting for it! I'll get this when it comes to NA. Only Ranger game I haven't played. @BurningSonic It might be the best of the three, so I hope you enjoy it! unfortunate that we can't do the DLC missions anymore, though. I remember trying this at a demo kiosk back in the day and not particularly enjoying it. I've played the first game and, while I enjoyed it, I've never felt compelled to play the rest of the series. @C-Olimar Haha 😂 It's all gonna happen! Now we have all the Pokemon Ranger games on the virtual console right? Average score for an average franchise. And like all DS games before it, the multiplayer is lost on the Wii U. @SLIGEACH_EIRE Pokemon ranger is not average! @Player4 Pokemon Conquest would be great, I never got the game on DS so would definitely buy it on Wii U.